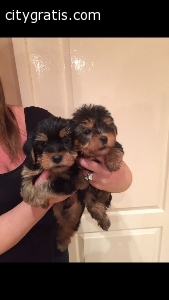 Show quality coated miniature in size Yorkshire terrier puppies now are available for their new loving family homes I have 2 females and 2 males available. Theses puppies have been brought up in a family home environment where they were loved and handled on a regular basis by my young children since birth. El anuncio expira en: -943 días.